Back in the U.S.A.: Plane is Leaving!! It's Monday evening here in Tokyo. The bags are packed. The refrigerator is clean. The wash is done and we are headed home tomorrow. Yesterday the whole Kono clan including Ken's brother and sister and their children and grandchildren and Ken, Yumiko and I traveled to Haramachi to say hello and good bye to Ken's parents who are buried there. We had a beautiful celebration in the Buddhist Temple where the monk chanted good wishes for us all. 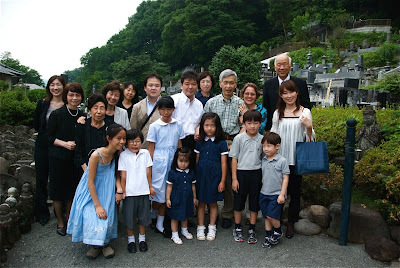 We gathered at the Kono grave site and bid farewell and then had a grand banquet in a wonderful restaurant nearby. I will give you an update on our travels when we get back to Pennsylvania. In the meantime, here's the Kono clan. (Check out Little Nowo, who is standing next to Yumiko in front. He's the boy with the white shirt holding Yumiko's hand. He ALWAYS makes faces - my kind a guy.